Winter might not be here officially, but with the holiday shopping frenzy having already begun and with temperatures that have steadily been in the 30s and 40s (at least in NYC), it sure does feel like Old Man Winter is here. Now for me, whenever winter first starts, there's always a period where I feel it's just too cold to wear skirts and dresses, even though I usually love to, and I switch to a uniform of jeans. That period began a couple of weeks ago, but by Thanksgiving, I was already bored with rotating the same three pairs over and over and determined to make more of an effort. To do that though, I realized I would need to invest in some sturdy, cold-weather tights. Preferably with some interesting colors or patterns since most of my tights are plain black. Cue the Anthropologie website. Anthropologie, which has been one of my favorite places to shop for years--as well as just ogle when I'm too broke to do so--currently has some really adorable tights. As well as some pretty nature-inspired patterns from floral to fishbone and new classics like polka dot, there was also some unusual colors like coral, plum and moss green. There was also an ombre pair in mauve, which I ended up buying. 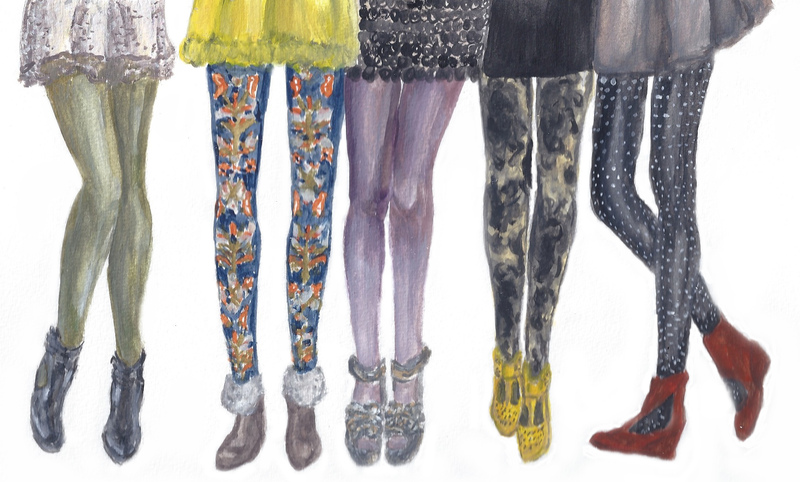 That pair is pictured in today's illustration, and in fact, all the tights pictured here are from Anthro as are the shoes. I was especially charmed by one pattern based on Russian folklore (second to left). It's also worth noting that I hadn't actually gone onto the site to buy tights for myself, but rather holiday gifts for others. (Anthropologie is always stocked with cute, giftable things this time of year, and I've got my eye on their sparkly loop scarves and antique-looking, patterned coffee mugs). And actually, some of the store's tights would make great gifts too, especially the ones in thick, winter materials.